Yom Kippur, or Day of Atonement, occurs on Tishri 10 and is the most solemn holiday of the year. 31 ...it shall be a statute for ever throughout your generations in all your dwellings. 32 It shall be unto you a Sabbath of rest, and ye shall afflict your souls in the ninth day of the month at even, from even unto even, shall ye celebrate your Sabbath. Yom Kippur was the only time in Bible days when the High Priest could enter the Holy of Holies. He went in before the LORD with the blood of a sacrificed animal to beg forgiveness for the sins of the people. Today there are no animal sacrifices and no Temple. The Jewish people rely solely on repentance for forgiveness of sins, but they have no assurance that God has heard and forgiven, for the Scriptures teach in Leviticus 17:11 that "atonement is in the blood". When Messiah Yeshua offered His own blood as our atonement or covering, the veil of the Temple was torn in two, signifying that He had opened the way into the Holy of Holies. By His sacrifice all who believe now have access to God and a covering for sin. We look forward to that great and final day of atonement prophesied in Zechariah 12:10 and 13:1 when all Israel shall mourn for the Messiah and accept the atonement He has made. On Yom Kippur, God’s judgment is sealed. This is the final opportunity for redemption. The entire world is judged this night. According to Jewish custom, three books are opened on the Feast of Trumpets and closed on Yom Kippur. 3. The Book of those in-between. If a man is deemed righteous, his name is written in the Book of Life for the righteous at the Feast of Trumpets. If a man is unrighteous, his name is written in the Book of the unrighteous. If a man is deemed in-between, judgment is delayed for ten days from Yom Teruah (Rosh Hashanah) to Yom Kippur. It is during that period of time that a man is given opportunity to repent before the book is closed and his destiny sealed on Yom Kippur. To "afflict your souls" is a Hebrew idiom which refers to "fasting". Thus, the only prohibitions for Yom Kippur is that you don’t eat or drink (even water). Children under 9 and pregnant women are not permitted to fast. Orthodox Jews also say you may not wash or anoint, can not wear leather shoes, and must refrain from sexual relations. Some sources say it is customary to wear white to symbolize purity on Yom Kippur, also. Kol Nidre is the evening service that starts Yom Kippur. The service is named for the prayer that begins the service. Kol Nidre means “all vows” and is a time when we ask God to annul all personal vows. Prayers should include prayers for Israel. You might also consider praying for the sins the church has committed against the Jews. O Lord, what miserable sinners we are. We make promises to live better lives each year and yet always fall far short of keeping them. Help us, O Lord, and pardon us for our shortcomings. 8. And Aaron shall cast lots upon the two goats; one lot for the LORD, and the other lot for the scapegoat (Azazel). Two goats were set aside – one for God, and one for Azazel (HaSatan or Satan). The High Priest cast lots to determine their fates. The one for God was sacrificed, and the other (the Scapegoat) represented Israel and the sins of the nation. Tradition teaches that the scapegoat had a scarlet ribbon tied to its neck with a portion of the same ribbon tied to the door of the Temple. The scapegoat was driven into the wilderness (some say thrown over a cliff). If the Jews had repented, the scarlet ribbon would miraculously turn white – a sign of God’s forgiveness. The New Covenant tells us that Messiah Yeshua provided our Atonement. The Mishnah tells us that 40 years before the destruction of the temple, the ribbon stopped turning white. This was when Yeshua was slain on the tree and became our Pesach lamb. The casting of lots reminds us that Messiah himself will one day judge the nations on Yom Kippur. The fall festivals are yet to be fulfilled in Messiah. "The Great Trump" at Yom Kippur. 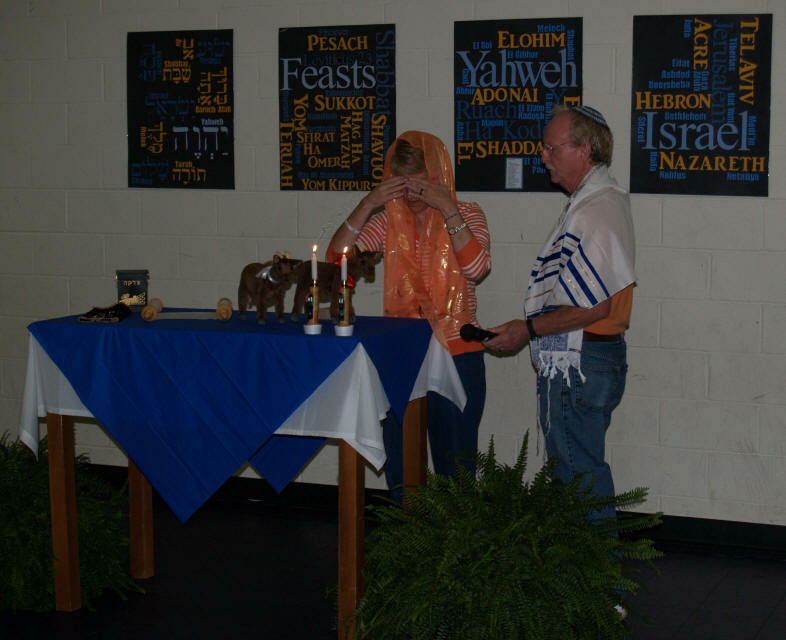 Traditionally Yom Kippur is the most solemn day of the Jewish year with fasting and prayer. Those of us who know Yeshua as Messiah, can also see reason for celebration since He became the "Atonement" for our sins with his sacrificial death. Yeshua became our "Atonement" with His death, burial and resurrection at His first coming. Each of the Fall Festivals will be fulfilled with his second coming. Yom Kippur points to His physical return to Earth and to His Judgment.